Simplex Unican 7104 has a deadlocking latch operation. Please note this is a dead locking Latch, and not a Deadbolt Easily programmed via keypad without removing lock from the door. 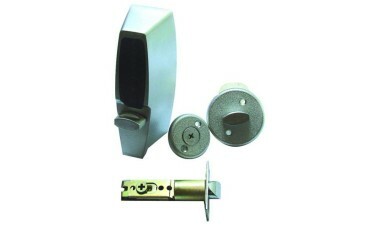 Light commercial & residential lock. Hi guys, my name is Darrel. 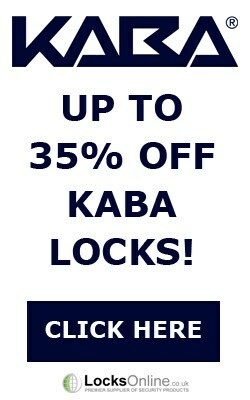 I'm head of the tech team here at LocksOnline.co.uk and thanks for taking the time to tune in and have a look at one of our product reviews. And, more importantly, the product that we are going to have a look at today is the Simplex Unican 7104 Combination lock. So, here it is in it's box. So let's get it out of the box and let's find out exactly what we've got in here and how it all gets put together. So if I was to open this box here, now. You get some user's instructions, as standard. You've got some fixing and all screws etc. here, as standard. If I was to now open this up here like that, and this is the actual combination lock there. You might start to get a bit familiar as to what it looks like now. And I'll go through all of this in a bit more information with a bit more detail now, as I get it all out of the box. This is the tubular latch there. This is the combination chamber. And, there should be a plate in here somewhere, ah, here he is yeah. Okay. And, here is the actual knob turn for the inside. So, let's get rid of the box there. And, let's have a look at the actual lock itself. So okay guys, Simplex Unican. 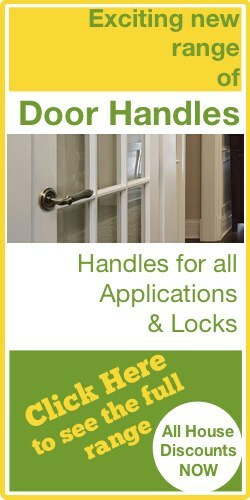 Why choose a Simplex lock? One of the benefits that Simplex have over other manufacturers of locks is, is that the way that the combination chamber works – And, to be honest with you, it's probably one of the most securest mechanical combination chamber locks. And I know that the governments use these quite a lot in regards to security. Because, it's not a sequence of numbers, it's a sequence of procedure. So for an example: you could have one-two-three-four. Or, the top button- the top button, the middle button, and the bottom button and stuff like that. But, what you can have also, is, you can have two buttons at the same time. Or you can change, you can tap one from there to there. So, it's more about a sequence as opposed to a fixed set of numbers, or, numbers in rotation. Some manufacturers' combinations could be having a code, say, 1 2 3 4. Well, 3 4 2 1 would also work. Or, 2 3 4 1 would also work. This, you've got to have the sequence right as well. So, it's a lot more secure. As far as I'm concerned, for commercial applications, and this one more like commercial- and then the 1000 series etc. for heavy commercial. But, these are designed for abuse. 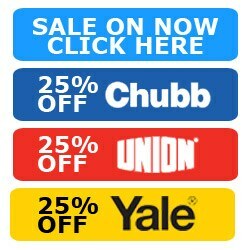 These are designed to go in places like commercial stated buildings where there is a lot of usage every day. Schools- we as an installing company, also fit them in schools quite a lot. Very, very good quality product indeed. So, how is it all put together? The actual tubular latch here. If I get the tubular latch out . . . I'll just set that down there for a second, to give you some more information, we'll get this latch out of here. There you go. Okay. That's the actual latch, here. To give you a bit more information, here, on the front, you see you've got this dead-locking snib here. I don't know if you can get in to that Ev. And the idea is, is that when you actually put it into its keep, that there gets pressed in. And by pressing that in, this then dead locks. So, you can't jimmy it. Or, you can't put a piece of slipping mica, which we would use in the industry, against the latch to try to jimmy it open because that little piece gets pushed in when the door gets locked into the frame. 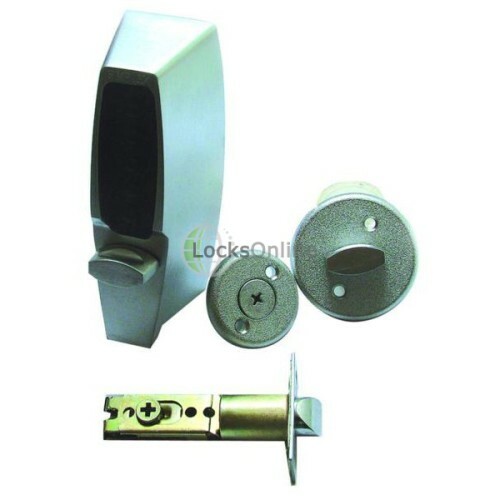 This particular lock is also available in two different backsets as well. One of the advantages is that this can be lifted and moved. It's either 60 millimetre backset. That's from the face plate, here, to that position. Or, 70 millimetre backset, from there to the position that it's set at now. But this here can move backwards or forwards, depending on what size backset that you actually, particularly want. So, this is the part that actually locks the door, as you can probably imagine. And this is the part that would actually sit there, in the door. And, I don't have door here with this on, but that's to give you some sort of idea as to what's happening. This would obviously be on the outside. This would be the latch. And this here, guys, would be your turn that would sit on the inside, here. And, he would sit on there like that. So, from the inside, you would operate the latch there like that. No problem at all. And, of course then from the outside, you would need to put in your combination chamber. Now, this one up here, sits out all on it's own, here at the very top here. And not only does it utilise the fixing screws here, to hold the combination lock through the door, into the back. But this is also the screw that you would turn in which to actually change the combination. Which, I will in another video show everybody how to actually change the code on these particular type of 7104 range of locks. So that's quite important there, we'll have a look at that a little bit later. That's basically how it's all fitted to the door. Now it comes with a load of fixings. There is a load of different size fixings in there, depending on the thickness of the door. But, it will accept a standard 44 millimetre door. And it will probably go up to a 55 millimetre door, no problem at all there. In fact, just for your information, I'll just quickly get a measurement there. Yeah, I'm pushing nearly 60 millimetres there. I know it's slightly bent down, but, yeah, 60 millimetres and that shouldn't be a problem at all. That's the actual lock itself. Okay? It will come as standard with a universal code that's sitting in there. You know, like I say, it is a beautiful piece of engineering. This is a weight, guys. This is quite a heavy, substantial lock. And you've got this little piece, here, as well, that you can use, that if you wanted to close the door behind you, you don't need a pull handle, or a handle. You can actually use that then, to pull the door behind you to lock the door after. So yeah. There you go. This is the Simplex Unican 7104. 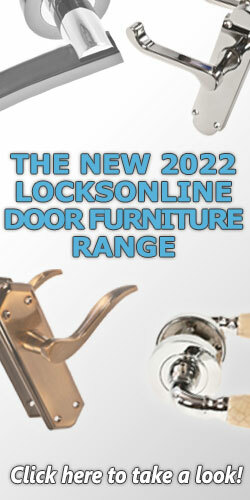 It's the one that's using the latch so it will automatically dead lock. When you close the door, this will automatically dead lock into position. It's the most popular one. It's the most common one. They do do a dead bolt version. We'll have a video of that up real soon, if not already. So from me, Darrel, many thanks for taking the time to have a look at this product in the flesh. I hope I've said enough here to give you an informed decision as to whether or not this particular product is suitable for your application. But if I've not made a measurement that you think, 'Oh, I could do with that measurement', or 'Let us know a little bit more information about . . . ' whatever, feel free to pop us over an e-mail. Or, get on the phone, we'd love to have a chat with you. Or, you could use our Live Chat. We've got a Live-Chat system online so you can talk to us, like messenger or so forth. You can just talk to us, you can chat to me, no problem at all. From me, Darrel and the rest of us here at the LocksOnline team, appreciate your time. And, thanks for coming along and viewing another one of our videos. Take care, guys and catch up with you real soon. Bye-bye, now.